The Texas Primary is the first Primary in the country so naturally there was some national media coverage. You can find the final election results here. Both Beto and Cruz easily won their seats for their respective parties. For all the Republican party hate against Cruz, he did incredibly well in his primary. But, Beto's numbers in the Democratic Primary weren't strong. Given the amount of campaigning and funding he amassed, he only attained about 62% of the vote. It should have been much higher! If you look at the map, you can see that Sema Hernandez won a majority of the border counties. Looks like that is where Beto needs to go next in his campaign stops and attain more name recognition. Furthermore, Hispanics, like South Asians, have a wide range of political preferences. Case in point: 40% of Hispanics voted for Gov. Abbott in 2014. The Hispanics in the Rio Grande Valley (RGV) care more about border security and are very pro-life compared to the Hispanics in El Paso and other major cities. Beto is outspoken against Trump's wall and is pro-choice, so it will be interesting to see how he can get these border counties to vote for him. Cruz began his advertising against Beto, which could potentially bring more name recognition to Beto since he still needs that. Overall, Beto has got one hell of a mountain to climb. There will be several Primary runoffs for the Congressional Seats for both parties. With Sylvia Garcia and Veronica Escobar securing their places in the Democratic Primary and representing a Democratic district, they will most likely head to D.C. They will be the first Latino women from Texas headed to Congress! The most interesting Primary runoff to watch is going to be TX-22 (Sugarland, Katy & Pearland) for the Democrats. You've Sri Preston Kulkarni who is half Indian half White and Letitia Plummer who is an African American Muslim. TX-22 is an incredibly diverse district with both a large South Asian and Muslim population. However, whoever wins this race is going to have an uphill battle in November against Pete Olson. Republicans: all incumbent office holders easily won their races without having to go into a runoff. Ag. Commissioner Sid Miller and General Land Officer were projected to have tough primaries but easily secured the necessary 50% of the vote to avoid a runoff. Democrats: all statewide offices are set for the November election except for the Governor's race. The runoff race between Lupe Valdez and Andrew White will be on May 22nd. You can see how each county voted below. Similarly like Beto, Andrew White is needing to campaign more in the border counties. Whoever wins the runoff has a much shorter time to campaign for the November election and it'll be a huge loss. BUT, if there are debates between Lupe and Andrew, it could bring in some much needed name recognition and momentum to the Governor's race and potentially make it competitive. There were a few close races but nothing too exciting here. Looks like Trey Martinez Fischer (D) is most likely coming back to the House. Rep. Villalba (R) lost his seat to a Tea Party member in the primary. Rep. Dwanna Dukes (D) lost her seat as well. Given her current legal fights it was somewhat expected. End result: These races are important but it is who wins Speakership in January that is going to really decide how things legislatively! Texans are well known to dislike to be told what to do and they showed it in a variety of ways. In TX-29, Tahir Javed was endorsed by Senate Majority Leader Chuck Schumer over State Senator Syvia Garcia, yet Garcia won the Primary by a landslide. In TX-7, Laura Moser running in the Democratic Primary was badmouthed by the DCCC (National Democratic Party) as being too liberal for the district. Apparently, voters didn't care and Moser made it to the primary run off for May 22nd. Empower Texas (the major Tea Party group) invested million of dollars in 16 elected positions and only succeeded in two of them. You can read more about it here. Lesson: Don't be a meddlesome fool in Texas, you won't win. 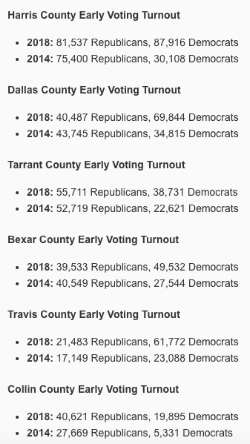 So, the media made a huge deal about Texas potentially turning blue and that didn't happen. Early voting turnouts for Democrats were making headlines and everyone was talking about a BLUE wave, instead we got a RED RIOT! As excited as everyone was about voter turnout, we have 15.1 million registered voters and only 16.5% went to vote in March. So, still an overall abysmal voter turnout. Republicans had 1.5 Million voters and Democrats had 1 million voters. Below, you can see the breakdown of how each major county early voted. If you look at the numbers more people voted for Cruz and Abbott than all the Democratic primary candidates combined (image below). But, I do think for Democrats, to have such high voter turn out in a non-Presidential primary is a major accomplishment. If the Dems want to really create a blue wave, they need to be realistic of the amount of work they need to put in prior to the November election and for 2020. As Evan Smith states, "Texas is its own path. Nobody understands that. Texas flies by its own set of coordinates politically. This is not a state that is in line, from a trend standpoint, with other places. This is a place that is a blood-red state. If other states move to the middle, or become more blue, Texas has resisted, resisted, resisted at all turns." Personally, I think it is incredibly difficult to have a progressive candidate win a statewide elected seat in Texas right now. Abortion and Immigration are two major issues majority of Texans agree with Republicans on and until Democrats attain a larger progressive population in Texas or change their platform, I predict they will continue to lose. Get ready for Primary Runoffs on May 22nd. Start registering voters for the November election. Continue to WiseUp on your candidates- attend their meet & greet events! Personally, I don't wish for a red riot or blue wave, I want a purple state. I want each race to be competitive, I want people to pick the best candidates regardless of party and I want people to realize one party is not the answer to all the state's/country's problems. It is a bipartisan effort. There are great and terrible candidates in both parties, please understand this, don't do straight ticket voting and always always WiseUp on the candidates before you go vote!